Enyimba International have missed a chance to go top in Group A of Nigeria Professional Football League following their disappointing barren draw against Insurance of Benin on Sunday in Aba. The People’s Elephant, who were on a seven-match unbeaten run prior to Sunday’s matchday 14 tie, were required to win against NPFL new boys and hope that MFM did not get a good result in Ilorin against Kwara United. Though MFM were beaten 1-0, Coach Usman Abd’ Allah’s men failed in their own part as they fired blanks and could only get a point from the home game. The result has seen the People’s Elephant drop to third spot even though they are now unbeaten in eight games. It was Shamsudeen Hashim that scored the only goal that condemned MFM to defeat on Sunday. But despite the loss, the Olukoya Boys are still on top of the NPFL group A with 23 points from 14 games. On their part, Enugu Rangers have moved up to the second spot in Group A following their 1-0 win over Katsina United on Sunday at Nnamdi Azikiwe Stadium. Pascal Seka, who scored a late equaliser for Flying Antelopes in the reverse leg against Changi Boys, got the only goal again in Sunday’s tie. Coach Gbenga Ogunbote’s team now have 21 points but they have played just 10 games meaning that they have four games outstanding. 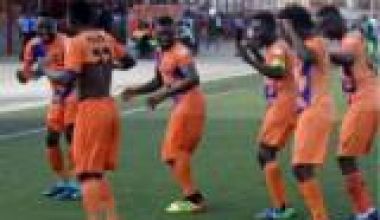 In Group B, the competition is quite tense though Akwa United are currently occupying the number one position after they defeated Gombe United 2-0 on Sunday. Late goals from Ndifreke Effiong and Wisdom Fernando sealed victory for the Promise Keepers who now have 25 points from 14 games. 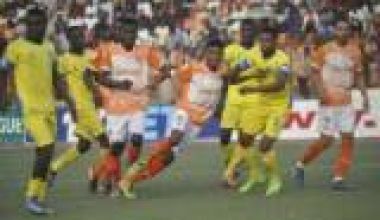 El-kanemi Warriors dropped to the second spot having lost 2-1 to Kano Pillars on Sunday. Though Borno Army also have 25 points from 14 games, they have an inferior goal difference compared to Akwa United. FC Ifeanyi Ubah who lost 1-0 in Lafia against Nasarawa United are third in Group B with 24 points while Kano Pillars are fourth with 23 points from 14 games. For this season’s abridged NPFL league, the top three teams in Group A and B after 22 games will compete in a Super six tourney to pick the champion.